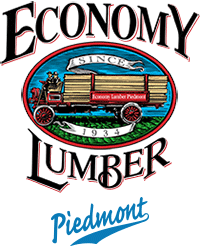 Since 1934, Economy Lumber Piedmont has been supplying local contractors, remodelers and do-it-yourselfers with quality lumber, building materials and hardware. Conveniently located in the heart of residential North Oakland, we are a full-service lumberyard and Do it Best hardware store with unmatched customer service. When you partner with Economy Lumber Piedmont you get more than a handshake, you get our promise to deliver the right product at the right price so you can do what you do best, build. We deliver everything we sell, from framing lumber and plywood to hardware and fasteners. Whether you need a one-time delivery for your home improvement project or you’re a contractor and need curbside delivery to your jobsite, we can help. RetroStop is an attractive wood door stop with an integral weatherstrip built-in. 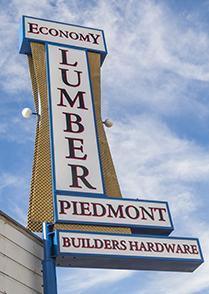 Economy Lumber Piedmont is a vestige of another era’ — your local, neighborhood lumberyard. Located within the Broadway-40th Street corridor revitalization.